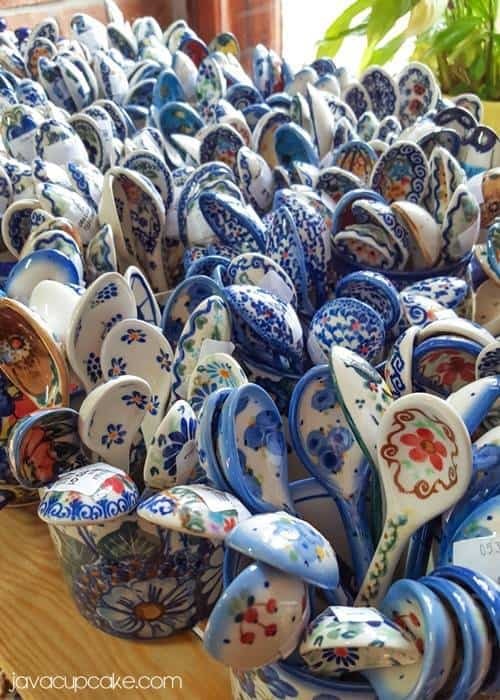 While living in Europe with the military, one of must-go-to places among the spouses is Boleslaweic, Poland to shop for Polish Pottery. If you live here long enough, you’re likely to go more than once. Last week, I went back to Poland for my third visit to buy pottery. I have only stayed over night once out of my three trips to Poland for pottery shopping. I found a room on booking.com just north of Bolesławiec for €48/night for a 4-person room with kitchenette and bathroom. It wasn’t anything special, but it was perfect for what we needed. Noclegi Gregoland was about 10 minutes from the center of Boleslawiec and the pottery shops. The Blue Beetroot is a very popular hotel for American’s to stay at when visiting Boleslawic. They speak English and I’ve heard nothing but great things about them. They also put together the map & guide of all the Polish pottery shops in the area. You can also look on places like booking.com, airbnb.com and homeaway.com for hotels and apartment rentals. If you’re going in the summer months, I suggest booking early because a lot of places fill up quickly in the town center. Make sure to read the reviews and check the accomodation listings to make sure they have eveyrthing you need. There are gas stations all over Boleslawiec. If you’re in the US Military from Germany, you can fill your ESSO card with money and pay US prices at any ESSO station in Germany. Use the ESSO Fuel Finder app (Android/IOS) to help you find their locations. I suggest filling up before you cross the border into Poland so you’ll have enough gas to go from store to store. Just as you enter into Poland on the A4/E40 there is a gas station and rest area. Here you can use the bathroom and grab some Polish currency called the Zloty. I found this was the easiest place to pull out money on the way to Boleslawiec. However, there are other cash machines throughout the city, just look for the banks because you can always find a cash machine there. Every Polish pottery store I went to accepted the Polish Zloty, the Euro and the US Dollar along with all major credit cards. Bottom line is that they want your money and they want to make it easy for you to give it to them. However, you are in Poland and it’s easiest to pay in Polish Zloty. I found that some of the smaller shops didn’t give back change in the currency you paid in but in Zloty. So, I suggest stopping at a cash machine to get Zloty. It’s just easier. Restaurants will always take Zloty and most will accept your credit cards. But, you will find that some only accept cash so it’s best to be prepared with Zloty. I have been in early Spring (March), late Fall and Summer to shop for pottery in Boleslaweic. The stores are open all year except for on holidays. The summer months are always the bussiest and most crowded because the weather is the nicest and it’s easier to walk from shop to shop without bad weather. However, if you plan to go in the summer and want to avoid the crowds try going on a week day as well as not during a festival weekend. The best deals however are on the big festival weekend in the summer. In 2015, I went on the weekend of August 21-23 and all the stores had sales and may had festivals with free food, games, entertainment and prizes. Check each store you want to go to for when their fesitvals and sales are when planning your trip. Since I live within driving distance, I can only advice you on how to get there via car. The A4/E40 takes you straighgt into Boleslaweic from Germany and is really the easiest and most direct route from Bavaira where I live. My best advice is to put your first location (hotel or shop) into your GPS before you leave to gauge how long it will take you to drive there. It really is worth the drive if you live in Europe. We did not encounter any issues with parking at any of the pottery stores in Boleslawiec. There was always a lot of street parking outside of every shop. During the festival weekend, there was only one lot I saw that was asking €1 a car to park. Some of the street parking in the city areas does require you to pay at a meeter, so bring change for that. Otherwise, parking is not a huge concern. I have only eaten at two Polish restaurants during my visits, but each was outstanding but I highly recommeend eating at Chata Opalkowa. Chata Opalkowa is where I had the most amazing perogies ever. My first visit to Poland I had perogies, but they weren’t anything to write home to mom about. These however were so good that I have made it my goal to learn to make them before I leave Europe. Yes, they were THAT GOOD. The Blue Beetroot hotel has already put together “The Map”. Among the military community here in Europe anyone who has been to Poland is farmiliar with “The Map” and we live by it on every visit. 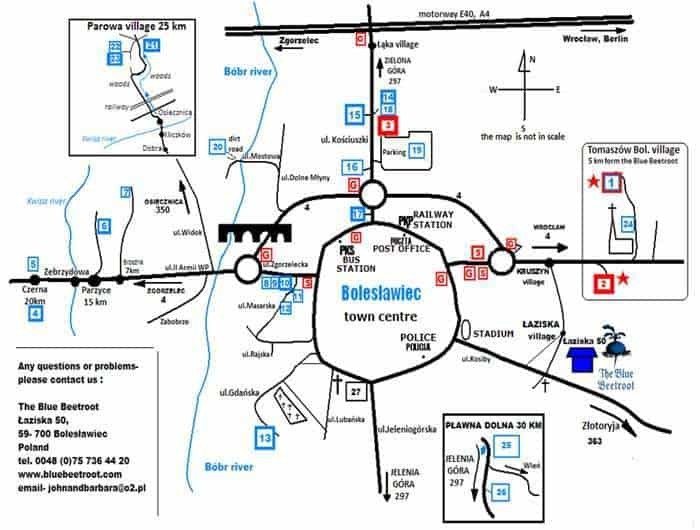 So, I’m not going to reinvent the wheel and make a new map or point you to google maps… I’m just going to share with you “The Map” by which we plan each and every trip to Boleslawiec. This map comes with a complete guide to every shop and what they sell, their location and hours and what currencies they accept. It truly is a must-have tool for your trip. Please note that this map is NOT to scale. You’ll need to use the locations listed on the guide to plug into your GPS to help get you there. Many of the shops also have websites and often have a Google map or GPS coordinates to help you get there. 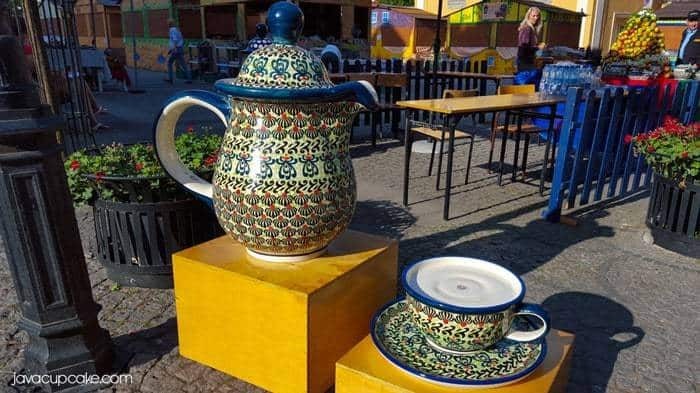 Not all Polish Pottery is created equal. You may find one bowl you love in a certain pattern in one price, but find another with a different price. This is because the quality of the pieces vary depending on their defects. On each piece of pottery will be a sticker with the “Gat.” rating. “Gat” is short for gatunek which means “quality category.” You’ll find pottery ranging from categories one through five. You’ll want to stick to #1 and #2. These are the best. Most of the brush stroke defects are very small and often times can only be see to the trained eye. “Gat 1” is the best quality; there aren’t any defects in the pottery whatsoever. Dishwasher, oven and microwave safe. “Gat 2” may have a stray brush stroke or mis-stamp, but the pottery itself is still perfect. Dishwasher, oven and microwave safe. “Gat 3” may have a crack in the glaze or may a have an air bubble in pottery. These pieces should not be used in the microwave, oven or dishwasher as the bubble may burst with the heat. Do not soak in water for the water may soak into the pottery. “Gat 4” may have a chip or crack in the pottery. These pieces should not be used in the microwave, stove and dishwasher or soaked in water. “Gat 5” will have major cracks or chips and are best for decoration. Do not eat on these pieces and do not put in the microwave, oven or dishwasher or soaked in water. You will also notice a difference in price depending on the style/pattern of the pottery. More expensive pieces mean their pattern is either rare or in high demand. You will pay more for the unique pieces with rare colors. I have been to every pottery shop on “The Map” and a few of them stand out as favorites. Starting with my most favorite store, I’m going to breakdown why I love them and what makes them different from the others. Manufaktura is my #1 favorite store in Boleslawiec because each time I have been there I have found things I love and can not live with out. Their selection of patterns is vast and their prices can’t be beat. This is the store that I bought the bulk of my Polish pottery from on my second visit when I got all of my everyday plates, bowls, serving bowls, etc. Manufaktura has a large sale section where every item is 20-30% off. This year, I went to Manufaktura during their anual festival weekend. In addition to their sales and selection they offered free food, factory tours, games with prizes, pottery painting and lots more! 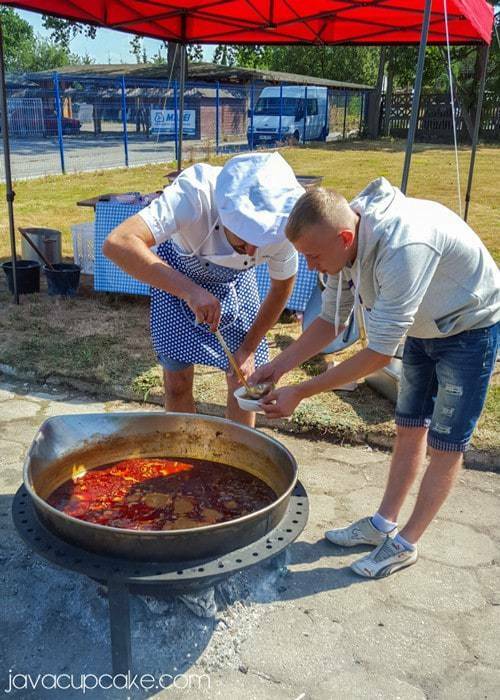 It was amazing to spend hours in the store shopping then relax in their back yard with a bowl of homemade goulash, bread and a beer. I never would have imagined being able to paint my own pottery too while in Poland, but Manufaktura offered me that experience. They took their tools and supplies straight from their workshops and made them available to the public to create their own unique designs. It was amazing to be able to do, see, experience first hand the process of painting pottery by hand. I didn’t take the tour this time, but I did get to sneak a peek into one of their work rooms! Rows and rows and rows of pottery waiting to be painted. And this was just one small part of their factory! 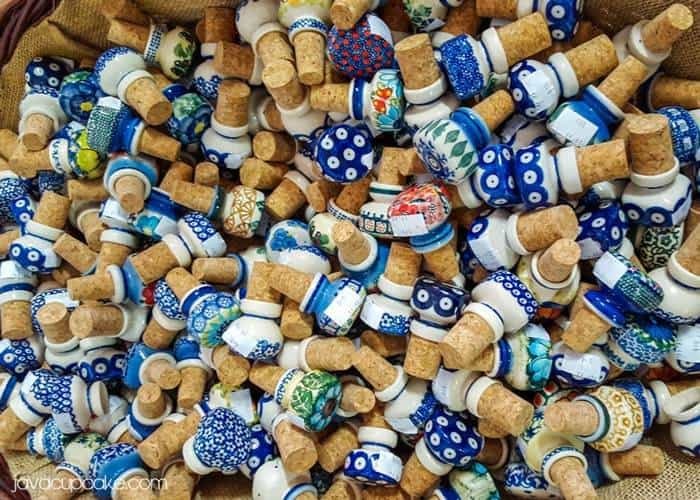 And because I’m so fascinated with Polish pottery right now, this video from Manufaktura shows a behind the scenes look at exactly how their pottery is made. Such an amazing process! I have probably purchased more items from this store than any other. In fact, we are planning one more visit to Poland before we leave Europe and this will be our first stop. I HIGHLY recommend Manufaktura! 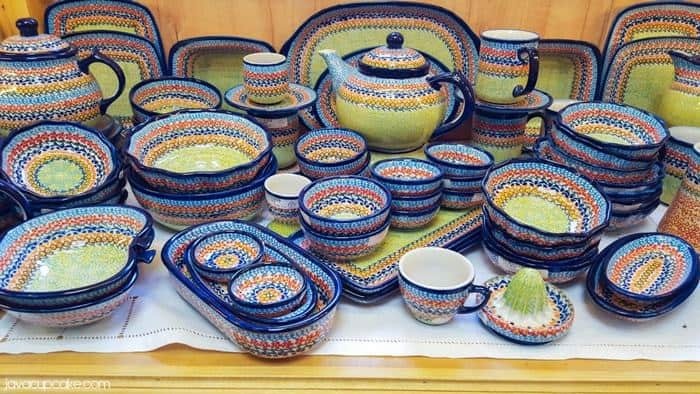 Everytime I go into Ceramika Artystycana I find unique patterns and pieces I have never seen before. This shop isn’t the biggest in space, but their shelves are packed and the prices are great! You can see in this picture how packed the shelves are! 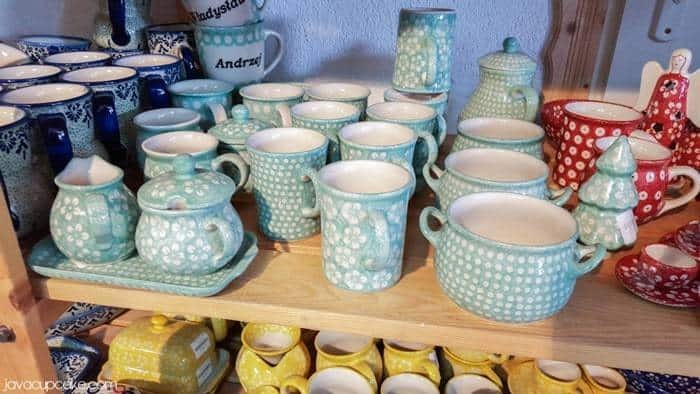 In Ceramika Artystycana you will find everything from tea cups and saucers to dinner plates, baking dishes, home decor and so much more. They sell only the highest quality products. Ceramika Artystycana also participates in the festival weekend in August with food, entertainment and great discounts! 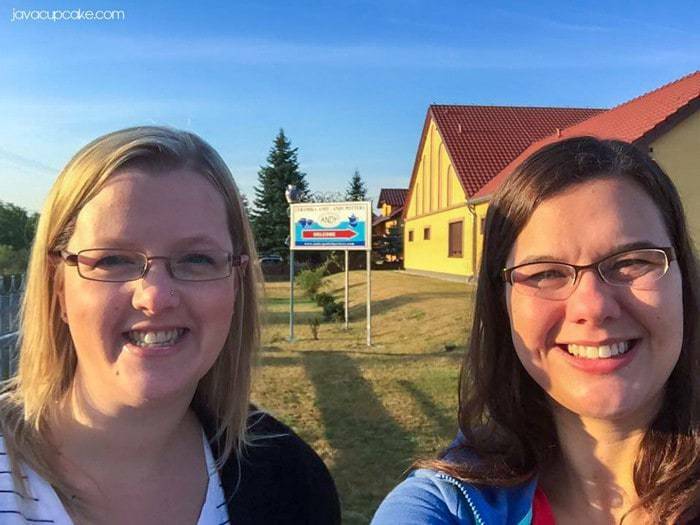 This photo is from my first trip to Poland in 2012 outside of Ceramika Artystycana! Across the street from Ceramika Artystycana are several smaller shops (#4, #8, #3 on “The Map”) that are definitely worth going to. Some of these stores have an upstairs that contain discounted items as well as wicker baskets and other unique items. If you’re looking for a deal, check out these shops. I scored this aqua cake stand, the only one I saw in all of Boleslawiec at one of these smaller shops. I did see this pattern at Manufaktura, but no cake stands. It pays to go into the smaller shops, you find onesies and twosies of things you may not find in larger shops! Out of all the smaller, off the beaten path, shops we went to, Millena was my favorite. This was a “mom and pop” shop that is located in the owners home and factory. It’s about a 10 minute drive from the center of Boleslawic, but compeltely worth the visit. We were the only ones in the store when we were there and I loved that we could take our time, not feel rushed and had the attendents complete attention to asnwer and and all questions we had. Millena had purple patterns and unique floral designs. They had so many other colors besides purple too, so much it prompted me to take pictures of everything. Most of the pictures from this post are actually featuring the bright colored pottery from Millena. I couldn’t get over this boutique shop and highly recommend it if you have the time to stray away from the city center and the clusters of shops there. My friend Lizzie scored these two tea pots, cups with saucers, and tea bag plates from their sale rack. They don’t completely match perfect, but it didn’t matter because the price was right! ANDY is a fan favorite of everyone I’ve ever talked to about going to Boleslawiec to shop for pottery. Although the shop isn’t the biggest, their selection has always been amazing and their prices even better! On the first day of the festival weekend, Lizzie and I were the FIRST ones at ANDY to shop. Bright and early at 7am Lizzie and I took a selfie as proof that we were first! They were also having a festival with discounts for shopping this weekend and free food and entertainment! Although I didn’t come out of ANDY this time with as much pottery as I thought I would, I will definetly be back and I 100% recommend for you to stop here. ANDY is so friendly to Americans. This is the only pottery shop that I know of that will do custom work specifically for military related items. I have seen Girl Scout mugs made, gifts for unit functions made here and military-related items curated by ANDY. If you have an upcoming event you need custom work for, I highly recommend contacting ANDY. Just make sure you give them several weeks/months advance notice! They will ship or you can pick it up! Unfortunately, I wasn’t able to find Henry’s online. 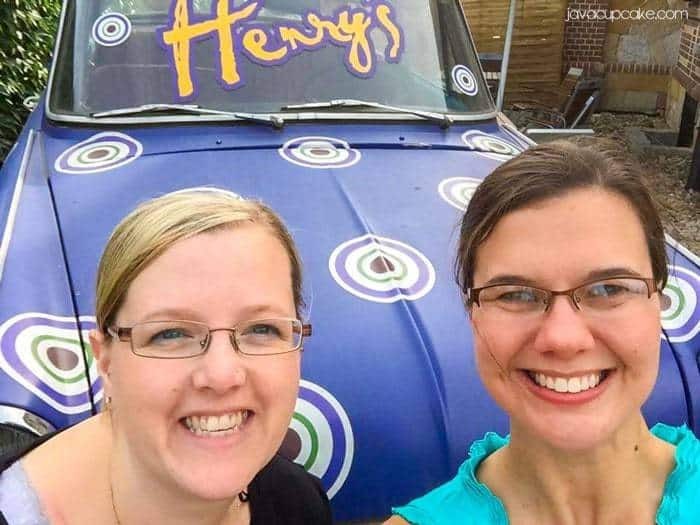 However, I did find this blog post that is completely dedicated to Henry’s, has a lot of pictures and is very helpful with lots of details about the store. What Did I Buy this Trip? This visit to Boleslawiec I was on a limited budget and had only an vague idea of what I wanted. Since I had been twice before (you can read about my first visit here) I knew I was looking for patterns that I had not seen before in colors that were unique also. I also knew I wanted to buy a mug stand and fill it with small coffee/tea cups. Can you tell what color I found? I don’t know if you call it aqua, teal, seafoam, mint or a combination of them all… but I will tell you it’s one of my favorite colors! I bought coffee cups, a plate, buter dish and cake stand in this color. Swoon. I’m in love! 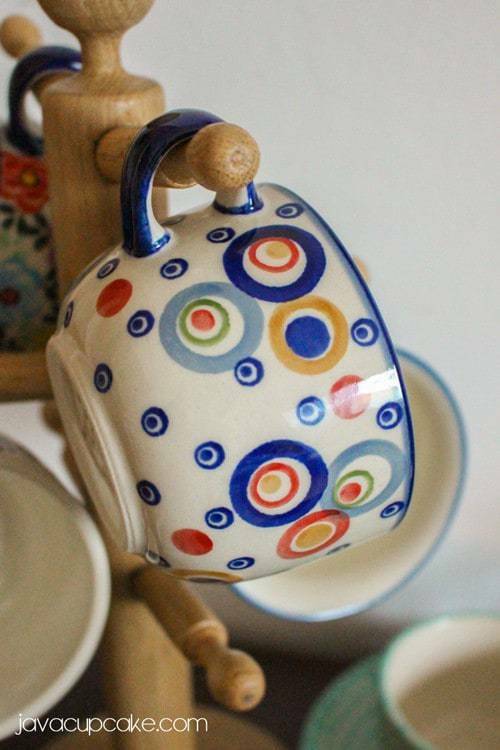 My friend Lizzie had gotten a mug stand on her last trip to Poland and I fell in love as soon as I saw it. 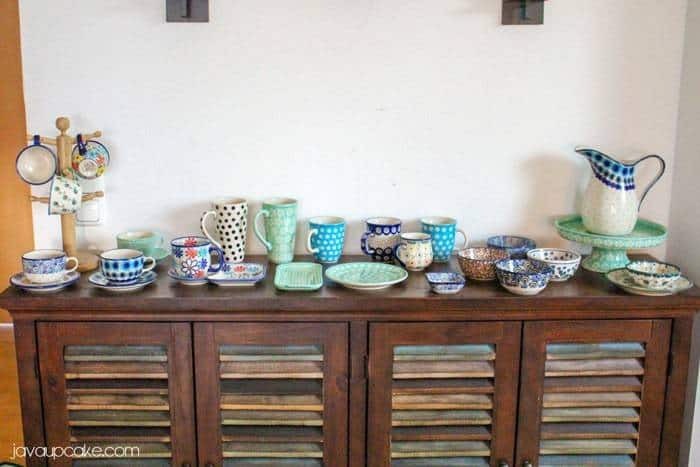 I have tons of Polish pottery, but not a lot of it is out and displayed. This mug stand was the perfect way to do that! So, this trip I bought one and filled it up with the most colorful mugs I could find! I can’t wait to have friends over so we can sip coffee together from these mugs! And I am seriously dying over this water pitcher. I found this one downtown at the main festival market. We arrived there so early that hardly any of the stands were open but as soon as I saw this, I snagged it. It had to come home with me! This might not be my last trip to Poland. There were a couple of items I had my eye on that I didn’t purchase this time and may want to go back to get. And my husband saw some prints that he loved too… so I feel another trip coming on this winter! I think I may just go back to buy more of the dot/swirl patterns in blue. LOVE them. If you’ve made it this far down in this post I’ve got a surprise for you! I picked up three mugs for three of you! Simply complete the entries below and 3 of you will get a mug I picked out just for you from Poland! Winners must have a USA or Germany mailing address. It looks like such a great trip…something I would love to do one day! everything looks beautiful! Love your tips & tricks! But what I love even more is that cake stand! I absolutely love the pattern of the cake stand you got. That pattern is the most beautiful the color is amazing and the little flowers are so adorable! Looks like a great trip. 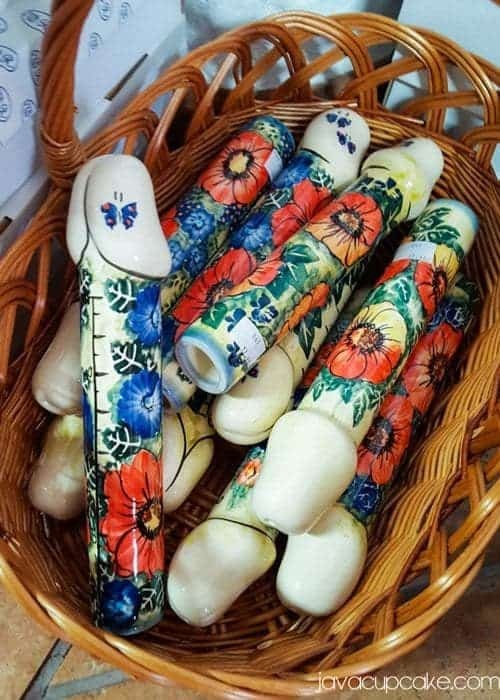 Your post has inspired me to actually travel to Poland and possibly purchase some pottery. I love the turquoise/light blue pieces you purchased. Thank you for such a detailed post on the subject. 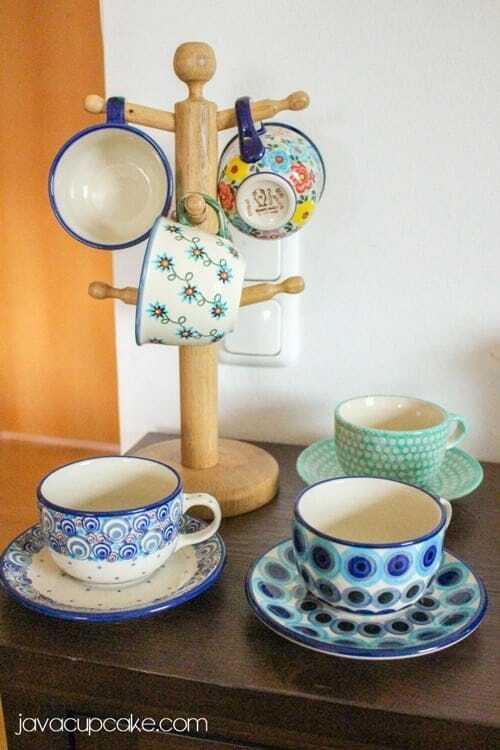 I was so sad that I was not able to go to Poland this weekend 🙁 Looking at all the beautiful pottery pictures makes me wistful….That cake stand is AHHH-MAZING!!! Great find! I love all the patterns you found! I have not been yet but it is on my list. Your post urged me even more to go. You must go! It’s so worth the trip! I was only able to make it to Poland once during our three years stationed in Germany but I loved every minute of it. I wasn’t able to get as many pieces as I would have liked to but I will always treasure the few that I did get. While all of the dishes you got are beautiful, I’m so in love with the aqua colored pieces. I really wish I would have been able to get some in that color! 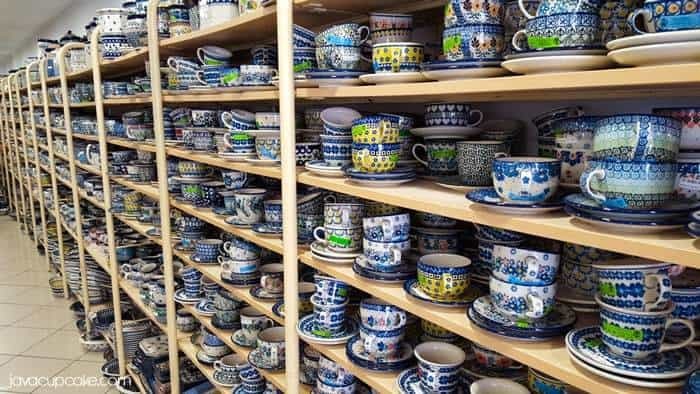 If you would have asked me before I moved to Germany if I would be the owner of this much pottery and have visited Poland 3 times… the answer would have been NO! lol But, here I am planning a 4th trip with a house full of pottery. It’s soooo beautiful and every time I go back I find new colors and patterns I can’t live without… like the aqua!! All of this pottery if beautiful, but I like the floral patterns the best. I seriously want every mug. All the patterns! All the colors! And the mug stand, too. I love that mug stand. SO PRETTY!! I love the aqua with the white flowers!! Polish pottery is beautiful. My sister in law and brother were stationed in Germany in the mid 1990’s and she sent us some wonderful pieces for Christmas that year. I have always hoped they would be stationed near Poland again, would love some more!!! I love all the aqua ones they are so pretty! So gorgeous! I hope one day we can go to Poland and check out the amazing pottery! 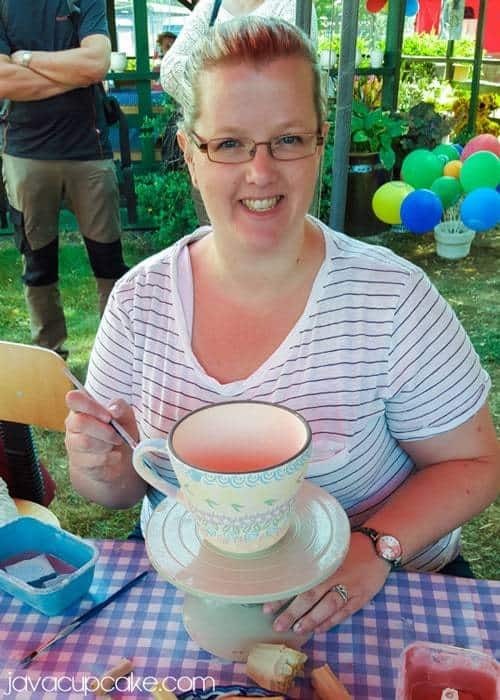 My husband is half Polish, so I’d love to win a piece of pottery for him (since a trip to Poland isn’t happening anytime soon, unfortunately). Thank you for sharing this information. I will definitely use it for a trip to Poland. 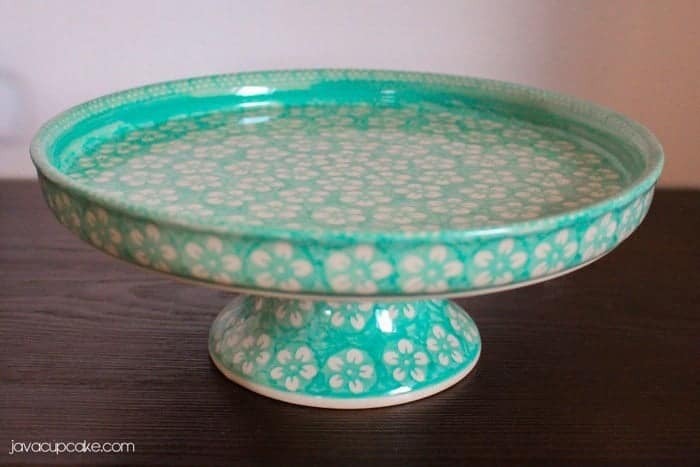 The Aqua Cake Stand floral print is my favorite! Thanks for this fun giveaway! Love love the polka dot patterns and the Aqua/sea foam find!! Beautiful pieces!!! So pretty! What a great post! Thanks! I am loving all this!! I want to visit Poland too! I love the aqua/ white pottery!! Beautiful! 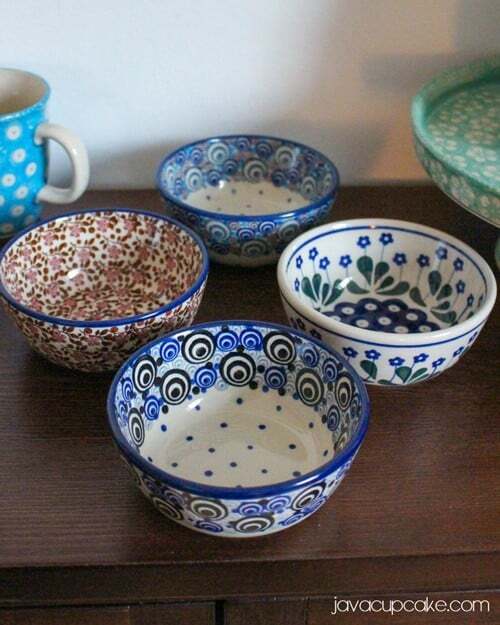 I love Polish Pottery! 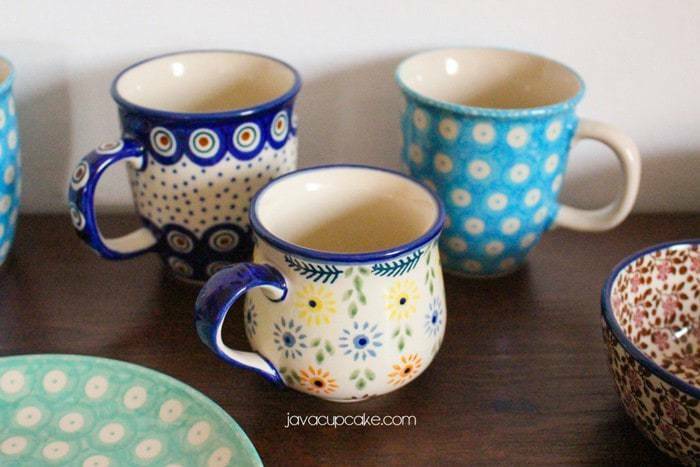 The cappuccino mugs with the colorful circles look so fun! Would love any of these designs. That looked like such a fun trip!! I had no idea that there were so many designs of Polish Pottery. LOVE IT ALL! OMG! Such nostalgia! I was born in Poland and raised in a Polish household, in America. (I was 2 years old when we were kicked out of the country.) My father was part of the Solidarity movement, and the government at the time said- Conform or leave. So with 5 children, (me at 2, my baby brother 1 and with Down Syndrome) we fled. I’ve been back to visit once, when I was 15. I just have never really had a yearning for my “old country” so to speak. 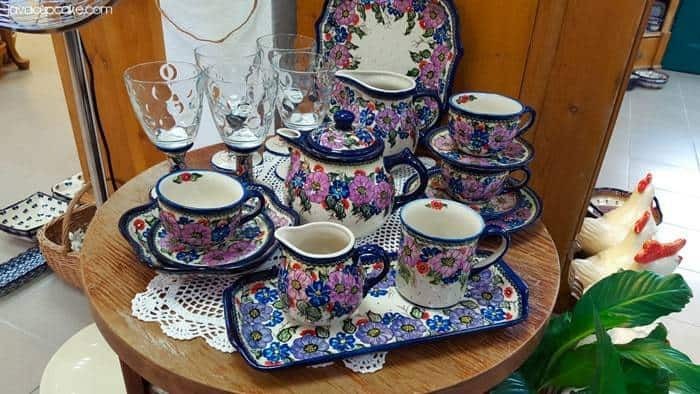 My parents and older siblings have gone back numerous times………..
My mom and I are heavy collectors of “Boleslawiec” or Polish Pottery. It’s one of our favorite gifts to give, and we take such pride in our array of bowls, platters and mugs when we have guests over. This is a great read! 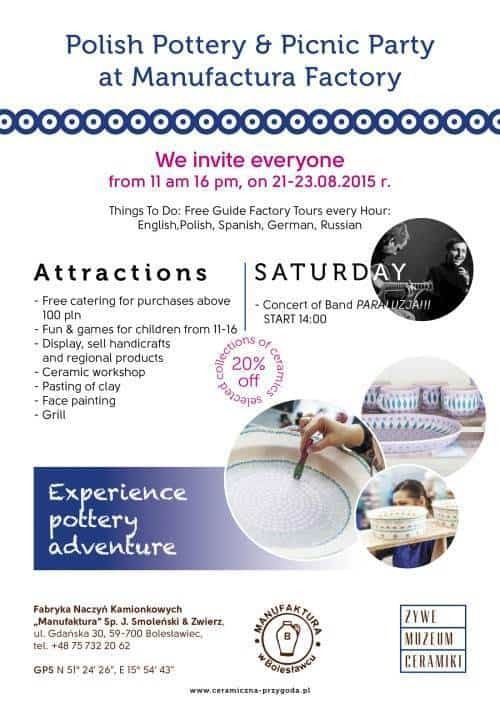 I’m new to Bavaria and am looking forward to my first trip for Polish Pottery! I’ve never really collected anything before, so I’m actually pretty excited about this stuff! Thank you! What a great story! I’ve looked at it over the years and visited Moscow but never Poland… Might have to extend a trip some day! 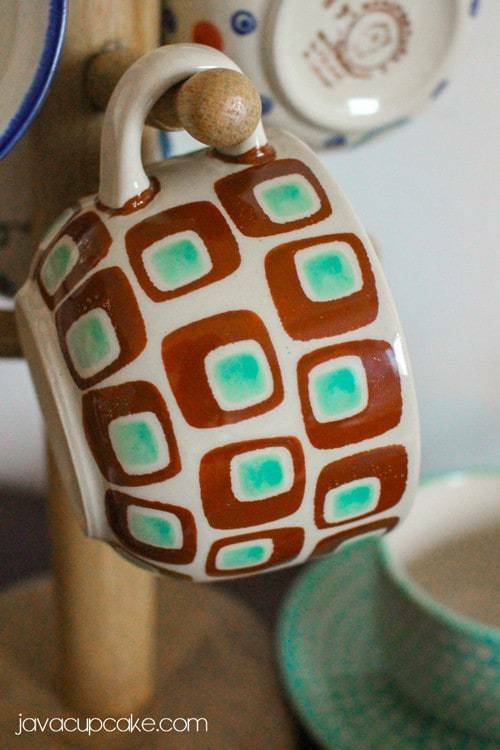 And I love the aqua mug with the white polka dots! Thanks!! I love all of the stuff you showed. I went there on a bus trip 11 years ago when we lived in Vilseck. I’m still kicking myself for not buying more. I now buy the pieces as I find them in the states. I quit trying to match patterns a long time ago and just try to make sure they all have the traditional shade of blue that most stuff has. I figure that it’s close enough of a match for me. I love this blog! I wish I had taken advantage of the closeness to Poland when I was there. 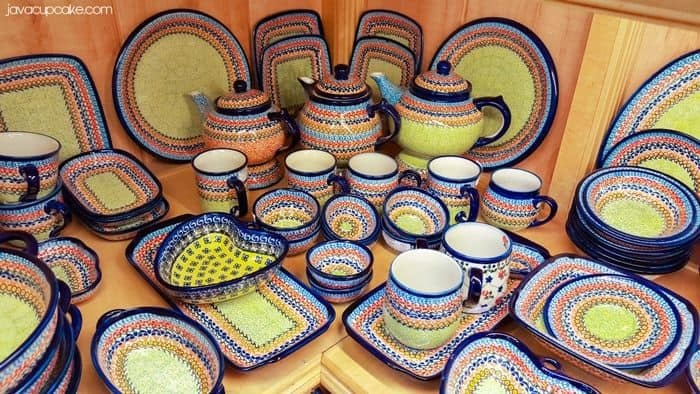 I love Polish Pottery! 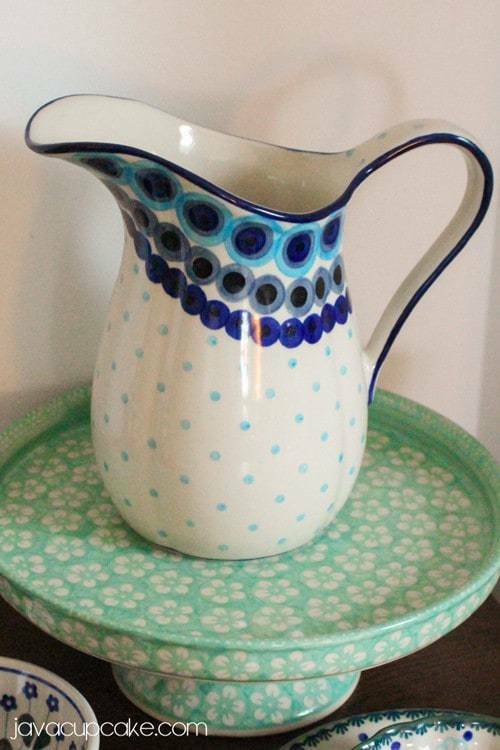 I am completely in love with the turquoise with polka dots!!! Such a great story and great pictures. The pottery is absolutely beautiful!! I love the blue bowl in the picture with the four bowls! 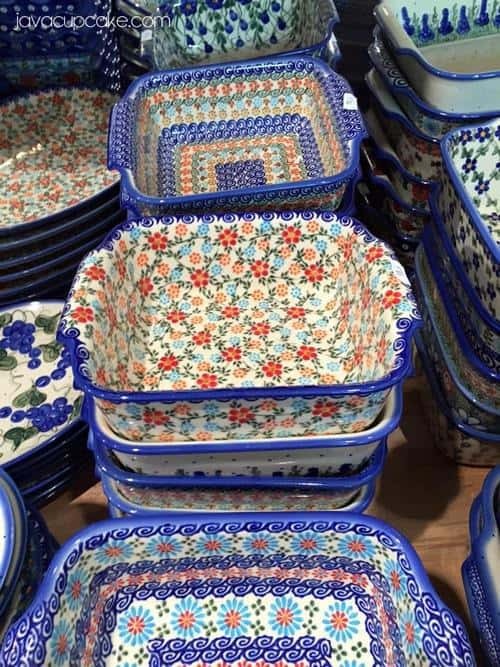 I had no idea Polish pottery was so cool looking. Your trip looked like fun, and I have pitcher envy. Thanks for sharing, you’ve opened my world to something new and beautiful! Wow, such beautiful and unique pieces That cake stand is stunningly beautiful. The pattern is so pretty. Thank you for your guide! Heading out for Poland tomorrow from Hungary. This guide and map will definitely help, even though I’ve been there before! I love the patterns that you chose! Hi Deb Jo! Thanks so much for the feedback! Please, let me know how your trip went! I hope you had so much fun and the guides I posted were helpful! thanks so much for this great review of Boleslawiec. We are heading there for a shopping trip in April. I’ll definitely use the map and all of your tips. Hi Betsy, I just want to congratulate you and thank you for such a well done and informative blog. You have helped us plan our trip! best wishes for much polka dotted painted happiness! Wow, so beautiful. I love all the colors and designs. 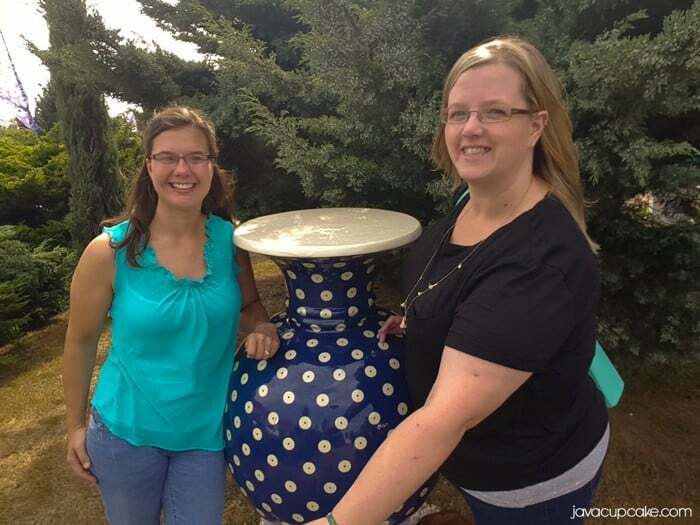 Thank you for sharing, it was fun to learn about Polish Pottery. Awesome design And also it looks beautiful. 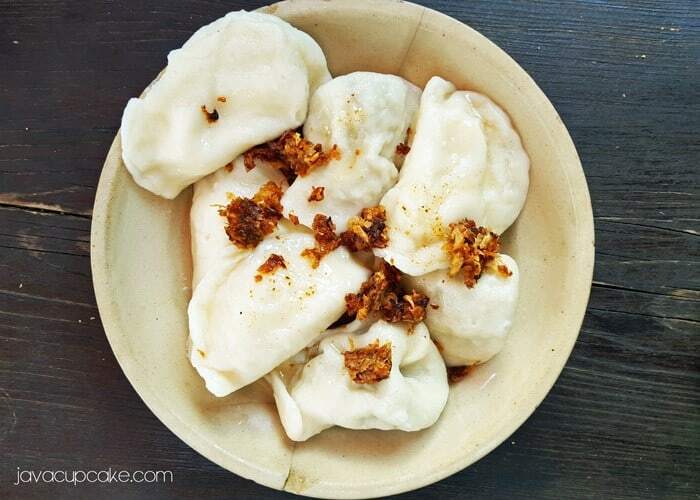 Perogies are very tasty. So is the Pottery and its design , looks fabulous. I love going to Boleslawiec and shopping. While I was living in Germany, we went three times. Now, I am back in the USA and planning a trip to Germany and Poland next November. I went on your blog to download the guide. You did such a great job of talking about all the wonder of this town and its pottery! I am going with an empty suitcase stuffed inside a bigger one so I can spread the pottery among our three big suitcases upon flying home. Seeing friends, Christmas Markets and pottery shopping are calling me back. Ooohhhhhhh have fun!!! I am so jealous you are going back! I wish I could live in Germany forever!! Enjoyed reading your blog and seeing your pictures. 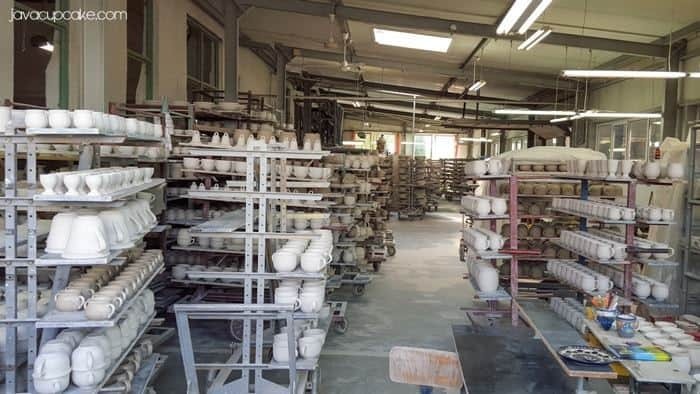 We are traveling to Germany in a few weeks and I would love to take a trip to Poland for pottery. I actually need an entire set of casual dinnerware. Would also consider just having lots of patterns to use together. Anyway, how much would you typically spend on plates, cups, platters, etc for casual dining? Here in US at Costco you spend $130 for a 3 piece setting of a dinner plate, salad plate and bowl (I think). I don’t have $1000-$1300 to spend on casual dinnerware. Would I be able to get potter there for much less $$? I’m also wondering how I would get it back to US with me. It would weigh more than my allotted baggage weight I’m sure. Do the stores offer reasonable shipping to US? Just trying to decide whether I make the trip to Poland or not. I think it will be a 6 hour drive from Stuttgart. Thank you for your reply Betsy! What is the best way to get items home? We are on a two week trip in Czech Republic and Austria. We have a day trip planed to Boleslawiec. Are there certain shops that will ship or do i need to ship in Austria? Thanks so much! Any tips would help tremendously! Unfortunately I didn’t have to ship back everything I bought because I lived there and drove it home. I know though that some of the stores do offer shipping… but you’ll need to ask. I know that it will be very expensive to ship back to the USA because of the size and weight of the boxes and it’s International rates. So be prepared to pay as much as you paid, if not more, for the pottery that you will for shipping. Hello and thanks for the information. I have been to Poland a couple of times and have fallen in love with the pottery!!! I am hoping to make another trip in the near future. My mother was born in Selbongen, East Prussia, which is now Zelwagi – so the town you are talking about it about 7 hours away from where we are going. 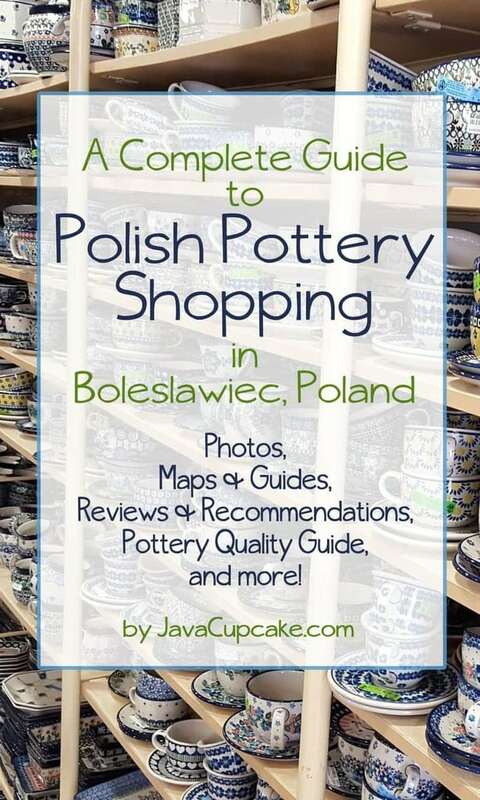 It sounds like Boleslawiec is the best place to go to purchase pottery for prices and assortment. Is that correct? 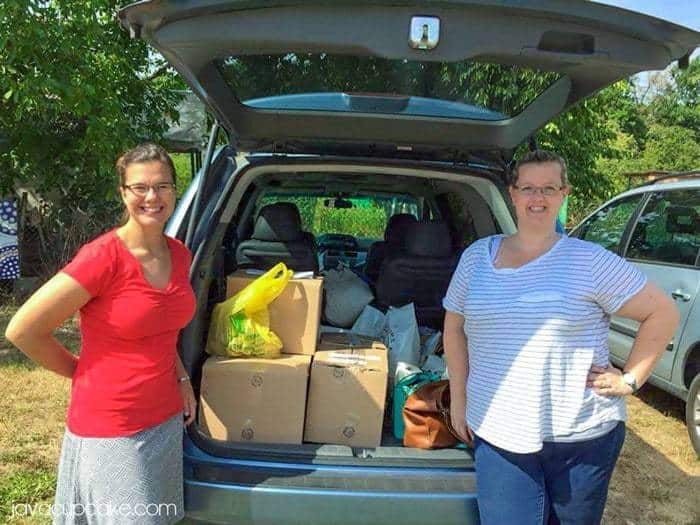 Hi Anita – I’ve only ever been to Boleslawiec for pottery shopping, but every time there have been so many choices to choose from that I never need to go anywhere else! You will definitely not be disappointed by going there for pottery! Have fun! we are planning a 3 week trip to Europe in 2018 for our 20th Anniversary (we got married in Wurzburg). I didn’t have to ship back to the US when we lived there but this time I will need to. Do any of the shops ship for you? If not what is my best option for shipping back to the US? I know Manufakturia ships! 🙂 As for the other shops, I’m not 100% certain who does and doesn’t… it’s been a few years since I’ve been back. They all speak English, so you could call and ask. Safe travels! Hello. Thanks so much for your post! I will be in Budapest in the fall and am wondering if a trip here would be worth the 7 hours it will take to get there. May I ask what an example of piece pricing may be? A salad plate? A dinner plate? A bowl? In USD, please. Thank you so much! Also, do they ship from the store to US? Well – I can’t tell you if it’s worth the 7 hour drive, however I’m always down for a trip to Poland. I lived several hours away and made the trip a few times when I lived in Germany. 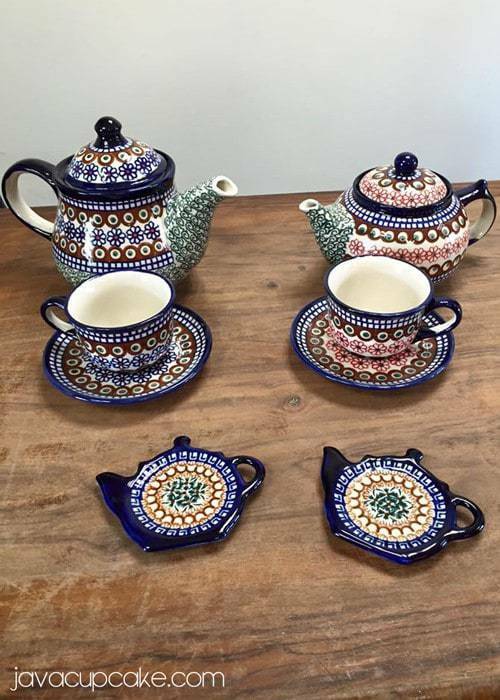 If you’re really into Polish Pottery… I’d go!! I don’t know what the prices are these days, however you can go to many of their websites and they have an online store and you can see prices listed there. Happy shopping! Hey Betsy! I loved reading your post-extremely helpful. I’m looking for Christmas polish pottery. Do most of the stores have Christmas pieces? Any that you would recommend?